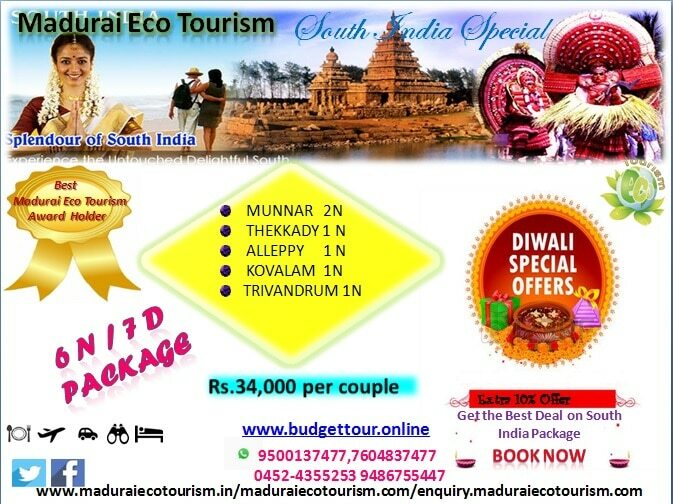 WELCOME TO MADURAI ECO TOURISM, YOUR ECO TOUR PROVIDER IN INDIA During your journey into a Madurai Eco Tourism Eco Tour, you take away sweet memories, leaving behind only your footprints and a pristine, natural mountain. Your guided tours and treks in & around Tamil Nadu have various themes ranging from Adventure & Jungle tourism to Heritage & socio cultural themes. Your Madurai Eco Tourism experience includes some of our poorest local communities. As a traveller, we are often remote and removed from these people, but Madurai Eco Tourism brings you in direct contact, so you can directly experience their poverty, love, humbleness, culture and how they are totally different from us, yet reminding us we are all human. Your Madurai Eco Tourism Eco Tour provides an alternate source of livelihood for the community and gives you a chance to enrich both your life and those you meet. We provide an end to end customized experience. You choose from trips such as Rural and city circuits with about 35 exotic locations to chose from. We organize trips for Companies, Families, Colleges and Schools. Madurai Eco Tourism Planning Megamalai Trip For Next Week (25-06-2016 & 26-06-2016) Madurai Eco Tourism is Best Trekking & Tourism Provider In Madurai . Best Tent Pitching In Madurai, Best Tent Pitching In Kodaikanal, Best Tent Pitching In Ooty. Best Tent Pitching In Kanyakumari, Best Tent Pitching Cochin, Best Tent Pitching In Kothagiri, Best Tent Pitching In Coorg. Best Trekking Places In Madurai, Best Trekking Places In Kodaikanal, Best Trekking Places In Kanyakumari, Best Trekking Places In Rameshwaram.